The following community economic development champions ask that the City of Calgary explore how it can enhance social procurement. Social procurement leverages existing buying power to increase community benefits, which can include local economic development, social impact, targeted employment or training, and environmental benefits. Why Now? The City of Calgary’s Sustainable Environmental & Ethical Purchasing Policy (SEEPP) was implemented in 2008. Since then we have experienced significant changes to our economy and trade agreements, and adopted Enough for All, Calgary’s Poverty Reduction Strategy. Enough for All was passed unanimously by City Council, and includes a strategy on Doing Business Differently. For these reasons and others, SEEPP would benefit from a review by the City of Calgary. Inter-provincial trade agreements, the renegotiation of NAFTA, and the new Comprehensive Economic and Trade Agreement (CETA) with the European Union, are changing the rules of procurement, and access to our markets must now be open to all bidders. 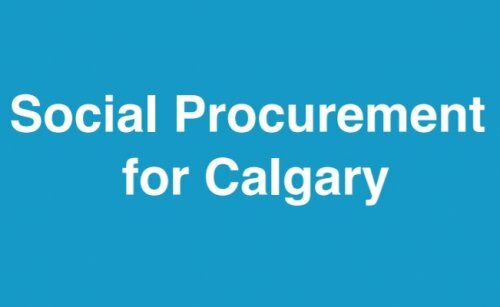 While this will result in potential bidders from around the globe, Calgary can use social procurement policy and guidelines to ensure that every bid and contract awarded delivers community, economic, social, and environmental value. Numerous municipalities across Canada have embraced a more strategic approach to procurement. The lessons learned, models, and templates are easily accessed and adapted for the Calgary context. Who is doing social procurement?